I'm off to book club tonight - although some would suggest that it is more a dinner and wine club but I beg to differ - I've read my book this month !! This is the Penguin Wine Hod by UK designer Steuart Padwick. 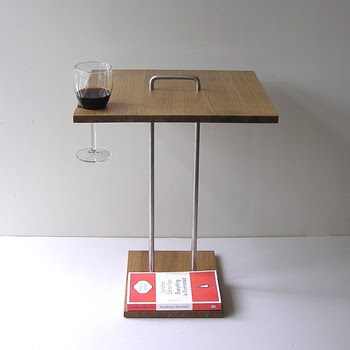 The perfect little side table for those prone to leaving full wine glasses on the floor and then inadvertently kicking them across the room. The 2009 model shown first has four little wine glass slots which would be ideal for a small apartment or balcony. 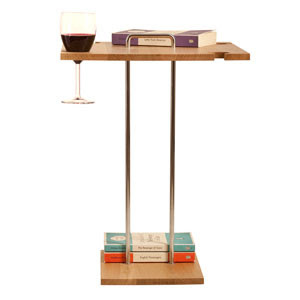 I like how the wine is at the top within easy grasp and the books are on the bottom ever so slightly out of reach. Just goes to show where the priorities are. Think this would suit our bookclub down to a tee! Isn't that perfect - and it just ooozes the atmosphere of relaxation. I want! And I also want the peace and quiet to go with a glass of wine and a book!